The province of Bologna is famous for being a hotbed of commercial, industrial and manufacturing activities; it is inhabited by ingenious workers with a strong entrepreneurial spirit who, in the past, created several activities that today have become the pride of Italy. Here is located the interesting company Centrostiledesign, with headquarters in Mordano. The company owes its development and growth to a brave young man who saw, in these years of economic gloom, a chance the development in a sector, design, that has suffered badly in almost 10 years of recession. Davide Cipriani bet on the company, on new investments and strategies, with willpower and passion. His younger age did not limit his dream, on the contrary it was a trump card; in a sector like yachting where entrepreneurism is in the hands of people very advanced in years, Cipriani made the most of what he had, making the company and the team grow in development that still continues today. Cipriani had the freshness, the will and the obstinacy to launch an activity that can be considered unique of its kind. Studio Ti (since 1990 a technical partner of many industrial companies) and Centro Stile, set up in 2001. Davide Cipriani founded the new company to offer project and design services to help and support several boatyards and national and foreign designers. In a short time Centrostiledesign became one of the main operators in the yachting sector, for its size and the variety of services offered. After 25 years of operation, today the Bologna company occupies an area of 4000 m² and has a total of more than 40 employees and collaborators who can create unique projects, starting from concept design through to the finished product. An extremely complete, wide-ranging and high-quality set of services, from design to structural analysis through to the production of models, moulds and prototypes. Today the company operates mainly in the yachting sector, as is shown by long-lasting collaboration with leading boatyards both on motor yachts and sailing yachts: Riva, Pershing, Gruppo Ferretti, Monte Carlo Yachts, Filippetti Yachts, Perini Navi, Solaris, Wally etc. the company’s clients are not only from yachting but also from the automotive sector, with names such as Argo Tractors, Ducati, Maserati, CNH Industrial (Fiat Group), and from the sector the company draws on technologies, methods and company strategies. The company’s field of application is the design sector in all its aspects. Starting from the briefing, the objectives to be attained are defined, materials, technologies, strategies, production methods, market and costs are studied, then comes the concept phase and product styling with graphic representation and a feasibility analysis. The team studies and tackles also the various project problems that could crop up, the development of the various technical designs and verification of all critical elements in the project and construction. Engineering and modelling: company technicians are in close contact with yard technicians and suppliers in a cohesive and collaborative team, in this way the construction process is better defined and flows smoothly, reducing times and minimising errors and problems. For executive and detailed design the company uses CAD 3-D programs, parametric and vectorial software and programs that find integrated solutions for structural calculus and project management to plan all activities. In this way layouts and kinematics of all elements in the product are completed and defined, studying every phase of production also with physical models to various scales, constructed in various materials and with differing technologies. These models help understand every aspect of the future product and recalibrate the characteristics of the project (details, surfaces, angles, measurements etc). The company can produce all kinds of models and dies (hulls, decks, hoods, dashboards) using five axis numerically controlled milling machines, 3-D printers, fibreglass dies, infusion dies, RTM or RTM LIGHT dies. These models can be built to all scales. Reverse engineering: this is carried out by a system of digital scanning, and makes it possible to scan rapidly objects of any shape and/or size and to make size checks that are very useful in the testing phase. Documentation: the company looks after everything concerning the preparation of the documentation needed for quality certification of the project and its authorisation, and also handles procedures for registering patents and preparing technical documentation. It has recently presented myYachtManual, an innovative app that replaces the old printed user manual and makes it possible to consult rapidly information and technical details, maintenance and operation of all instruments on board directly from a mobile device (smartphone or tablet), even on board. CFD/FEM analysis and calculation: the company offers full integration of tools such as solid parametric modelling and finite element numerical analysis (FEM), thus making it possible, before physical prototypes are produced, to define geometries that are optimised in shape and weight, rapidly handling any modifications, cutting production costs and improving the performance of components. 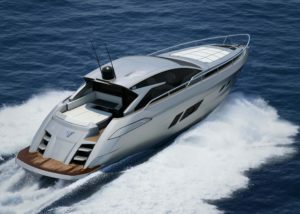 Today the team is busy presenting new motor yacht models for the Filippetti yard in Fano. Filippetti Yacht is a yard founded by the owner of Pershing, and shows the sporting lines of its yachts and the markedly masculine and captivating look. At the latest Miami Boat Show Filippetti presented the latest S55 model for which Centrostiledesign designed the exteriors and interiors. The result is a marriage of decisive and aggressive lines, high performance, elegance and extreme comfort. The yacht completes the new sport line of the Fausto Filippetti yard, a historical leader in Italian yachting, with which Centrostiledesign collaborated on the design of the other two models in the line. For the S55 the designers handle both the exterior and the interior lines, creating a concept with a dynamic and decisive character. The yacht has compact and aggressive lines, coupled with extreme comfort and great livability for the interiors, made possible by solutions such as the glass door at the stern that can close and protect the saloon or completely open it, supplying, together with the large side and forward windows, a large quantity of light and space to the interiors, making it possible for those on board to be involved in the spectacle of the sea. The sporty and decisive lines that characterise the exterior look combine perfectly with the elegance of the interiors. The contribution of Centrostiledesign to the work of the Filippetti yard was very useful and valuable, it was not just a matter of following the project but, thanks to a number of technologies, the team handled every aspect of the yacht. The phases are numerous, various concepts are defined and then the most convincing are selected and developed until the one that works best is found by exclusion. From this point, everything is studied up to modelling (virtual and physical). Surfaces, angles and styles are looked at and every structural and technological element is evaluated. Thanks to physical modelling, it is also possible to evaluate the performance of materials, such as resin and paint applied directly to the scale or full-size model. Control is complete, from the conception of the project to its construction, through every production phase. Continuous remodelling ensures control in several directions in a continual back-and-forth, each time calibrating every step in the production process. The new challenge the company wants to tackle today is the design of a complete project. Hence the concept of the M60, a 60 m megayacht. This first project will allow the company to understand the dynamics behind a large and complex project, a new exploration to make Centrostiledesign grow. Currently the concept is still being defined, they have studied all the external lines, the handling, the various surfaces, the balance and an interior distribution that is still sketchy but useful for evaluating the external shapes that will be created (terraces, windows, openings, private areas, public areas, coverings etc). Several scale models have been produced to evaluate all the characteristics of the vessel and the technical and aesthetic aspects. Later the interior will be studied in detail and materials and colours chosen. Ergonomics, design, volumes and surfaces are studied in detail and evaluated by the various technologies the company has. A team is taking part in the creation of this concept: technicians, designers, engineers and architects. All take part in the overall project with complete collaboration; each designer draws on the know-how of the others; several brains, eyes, pencils and ideas that will arrive together to the final winning project. Very interesting are the forward terraces that protrude from the hull and offer more space forward, also improving the view during manoeuvres. Function in harmony with ascetics is one of the goals the company has set itself for this concept. Another very interesting element are the glazed surfaces that characterise the yacht, their size ensures a “window” of 175 cm with an all-round view of the sea. Astern, there is a convertible saloon on the upper deck, a kind of hybrid opening space that can become a flying bridge. On this deck there will be no private areas but only public spaces and finally the control area: the cockpit for the forward command. Astern on the main deck is a swimming pool with a transparent bottom that gives the lower deck interesting and exciting lighting, light filtered through the water. The hull is particular, together with the plumb bow it does not follow the usual layout but presents a series of decks that are not stepped but have different dimensions, giving the composition rhythm and dynamism and making the hull-deck join imperceptible. Below water there is a tunnel and a single hull forward, two side garages, a tender housing and a bathing platform astern with latest generation toys.